More recently, there was also a a plug-in chock full of classic vocal effects. iZotope Möbius brings an effect largely used in experimental sound design into prime time. At its core is a perceptual trick called the “Shepard Tone” (named for a guy named Shepard). Like the visual illusion of stripes on a rotating barber pole, the sonic illusion of the Shepard Tone (or the continuously-gliding Shepard–Risset glissando) is such that you perceive endlessly rising motion. Here, what you should do for your coworkers / family members / whatever is definitely to turn this on and let them listen to it for ten hours. They’ll thank you later, I’m sure. The Shepard Tone describes synthesis – just producing the sound. The Möbius Filter applies the technique to a resonant filter, so you can process any existing signal. Musical marketing logic is such that of course you’re then obligated to tell people they’ll want to use this effect for everything, all the time. EDM! Guitars! Vocals! 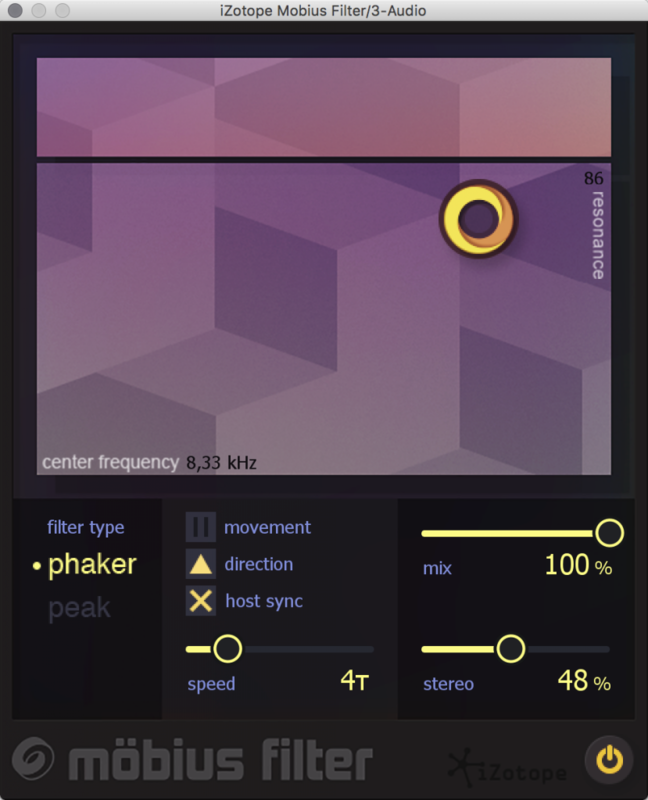 Whether you play the flugelhorn or are the director of a Bulgarian throat signing ensemble, Möbius Filter adds the motion and excitement every track needs! The ability to add sync effects (and hocketing, with triplet or dotted rhythms) for me is especially endearing. And while you’ll tire quickly of extreme effects, you can certainly make Möbius Filter rather subtle, by adjusting the filter and mix level. Möbius Filter is US$49 for most every Mac and Windows plug-in format. A trial version is available. If you want to try coding your own shepard tone synthesis, you can do so in the free and open source, multi-platform environment SuperCollider. In fact, SuperCollider is what powered the dizzying musical performance by Marcus Schmickler CDM co-hosted with CTM Festival last month here in Berlin. Here’s a video tutorial that will guide you through the process (though there are lots of ways to accomplish this). The technique doesn’t stop in synthesis, though. Just as the same basic perceptual trick can be applied to rising visuals and rising sounds, it can also be used in rhythm and tempo – which sounds every bit as crazy as you imagine. Here’s a description of that, with yet more SuperCollider code and a sound example using breaks. Wow. Finally, the 1969 rendition of this technique by composer James Tenney is absolutely stunning. I don’t know how Ann felt about this, but it’s titled “For Ann.” (“JAMES! MY EARS!” Okay, maybe not; maybe Ann was into this stuff. It was 1969, after all.) Thanks to Jos Smolders for the tip. So, between Möbius Filter and SuperCollider, you can pretty much annoy anyone. I’m game.